To change the prices, just enter the desired price next to the crop and then click "Apply Changes" at the top of the window. Changes will take effect for the current year's harvest. 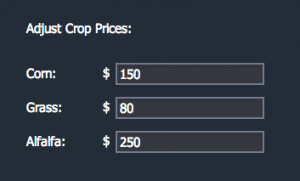 Note: If you have "Market -Driven Prices" enabled in the Game Settings, you will not be able to change the prices in this manner. If you wish to change them, you must uncheck "Market-Driven Prices" and click "Apply Changes" before entering your new values.